This image shows the radiator section (rear end) of the Wide Field Planetary Camera II (WFPC2), installed on the Hubble Space Telescope. 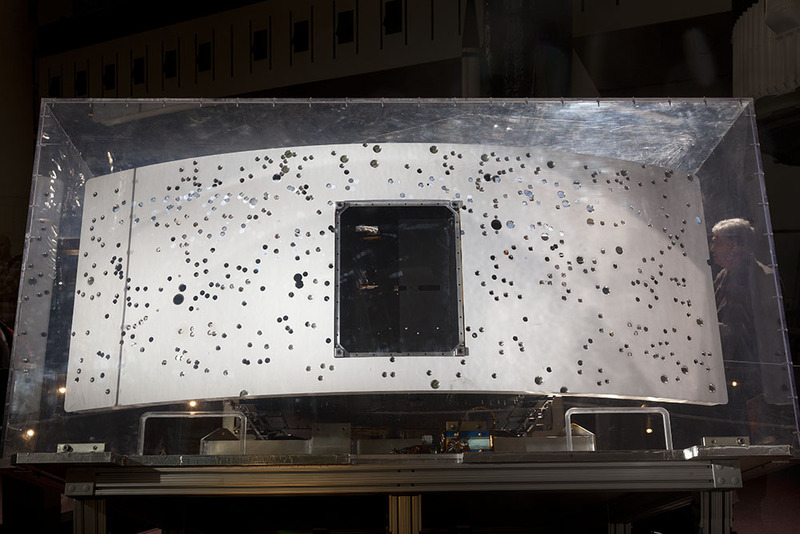 During the various Hubble servicing missions, astronauts noticed tiny dimples and dents in the radiator – the result of space debris. After more than15 years of exposure to space, this surface became a record of the accumulation of such debris in low Earth orbit. Naturally, NASA wanted to evaluate the amount and nature of this debris, and so after the camera was returned to Earth the impact sites were analyzed. The largest core samples left holes about 30 mm in diameter, but the debris particles were less than a mm in size. The analysis is ongoing.